The fun sports activities planned include micro rugby, mini tennis and other athletic events. Limited to a maximum of 15-20 children per day, so sign up now to avoid disappointment. No bookings can be taken on the day. As you can see from the table above, there are five weekly 3 hour sessions for 3.5-7yr olds and four weekly 1 hour sessions for 2-3.5yr olds. Plus a 1 hour session for each age group on Saturdays. 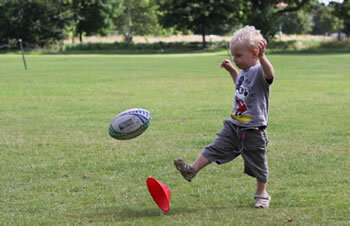 Single session fees for 3.5-7yr olds is £35.00 per child per day, and £15.00 per child per day for the 2-3.5yr age group. To offer you the best value for money and to help keep your kids occupied these holidays, they have some exceptional discount deals for you! One or two days per week will be at the normal rate. Book three days a week for £99.00 (a £6 weekly saving), four days for £125 (a £15 weekly saving), and all five days for £150 (a £25 weekly saving). One or two days per week will be at the normal rate. Book three days a week for £39.00 (a £6 weekly saving), or all four days for £50 (a £10 weekly saving). If you book for all four or five days per age group per week, you get that Saturday FREE! NOTE: These discounts apply to all bookings received and paid for quoting PutneySW15.com. To register your child (ages 2 – 3.5yrs) for the Summer Camp please click here. To register your child (ages 3.5 – 7yrs) for the Summer Camp please click here.